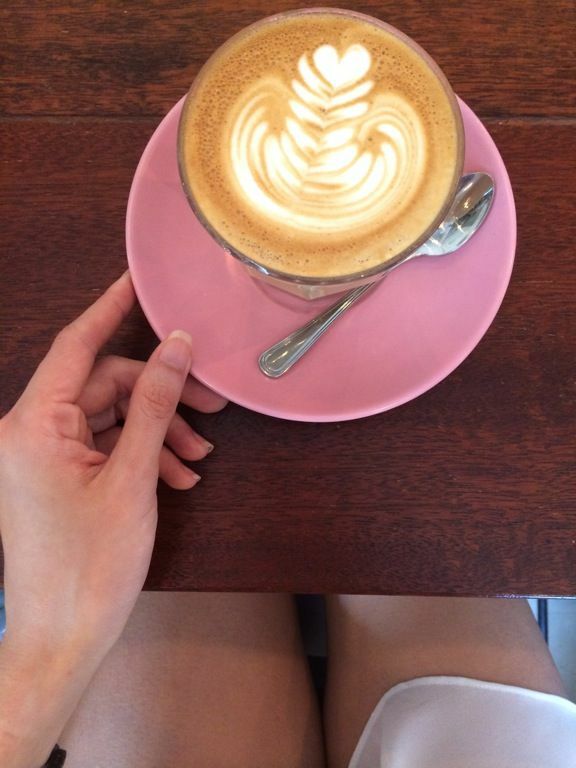 Caffeine addicts, here is another cafe for you to check out. 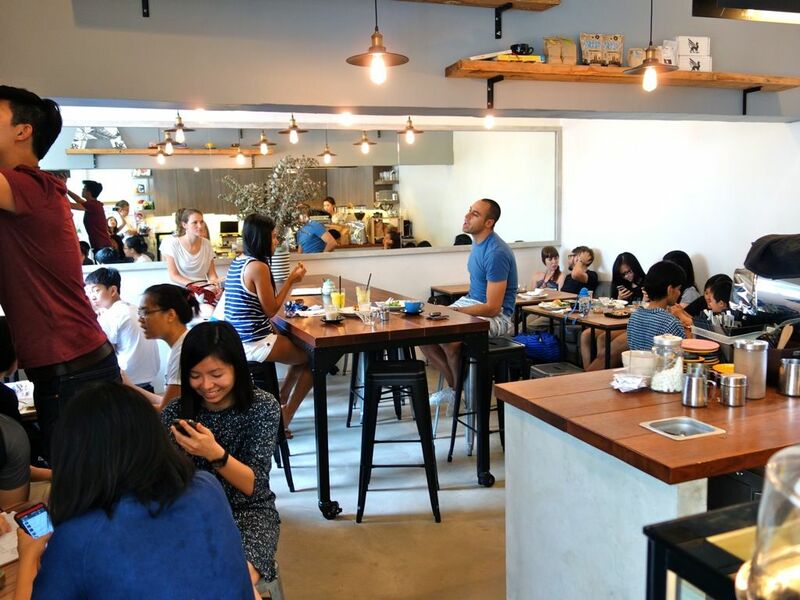 Assembly Coffee, a hole in the wall cafe (literally) at Evans Lodge (sandwiched between Mr Prata and Wine Company), has a coffee menu more extensive than their food menu. Oh but you really shouldn't miss out on the best scrambled eggs and waffles here too. RAVE ALERT. The cafe is a little on the small side and accommodates a maximum of 30 people and that would be an insane crowd already. We took a seat at the communal table and i have to stress that it's not for fat people. My fat thighs barely squeezed through the gap between the table and the high stools. The awkward height also made it almost impossible for us to eat without exposing ourselves indecently. I kid you not. 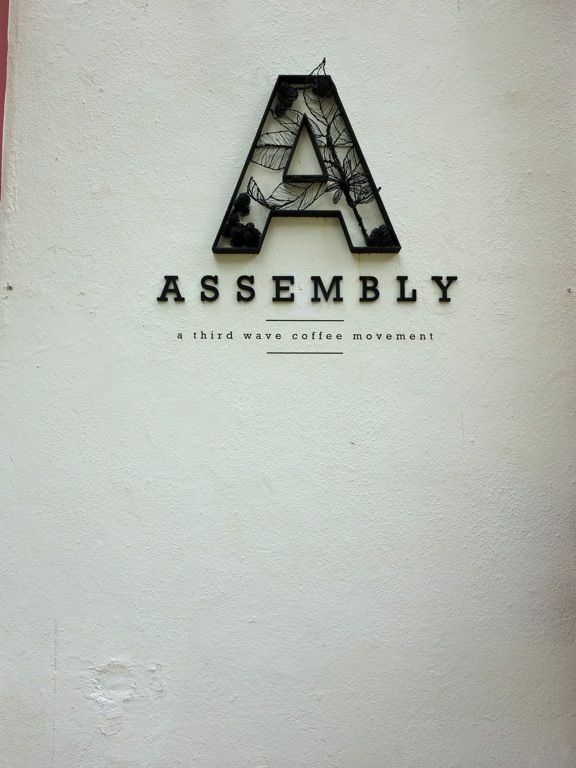 Assembly Coffee uses beans from local roasters Liberty Coffee and Geisha Specialty. We had the Liberty Coffee Speakeasy blend on our visit which was delicious (i had the latte). The drinks menu is 90% caffeinated so if you don't drink, you don't really have many options other than some juices and chocolate drinks. 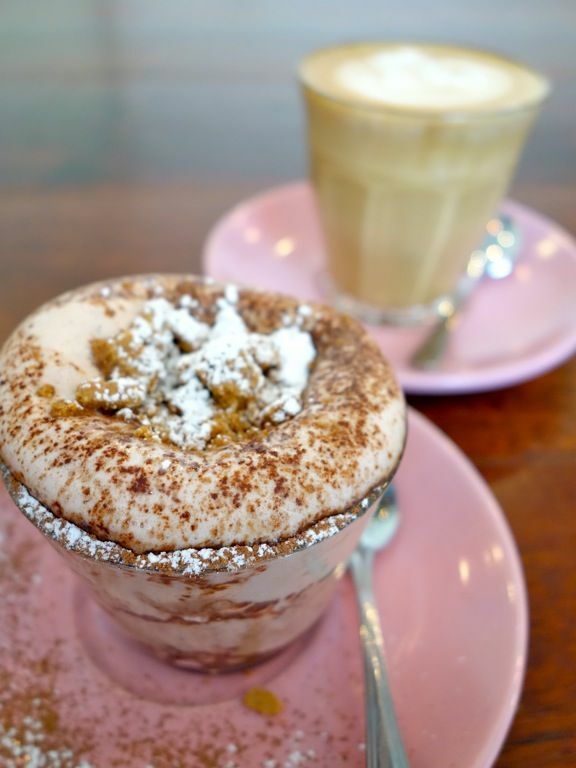 The Babychino ($3.90) was the cutest little chocolate drink that looked like a soufflé but i thought it was just mostly cream. I wouldn't consider it for a drink though. Breakfast people can get their All Day Brunch here at Assembly Coffee though options are limited. 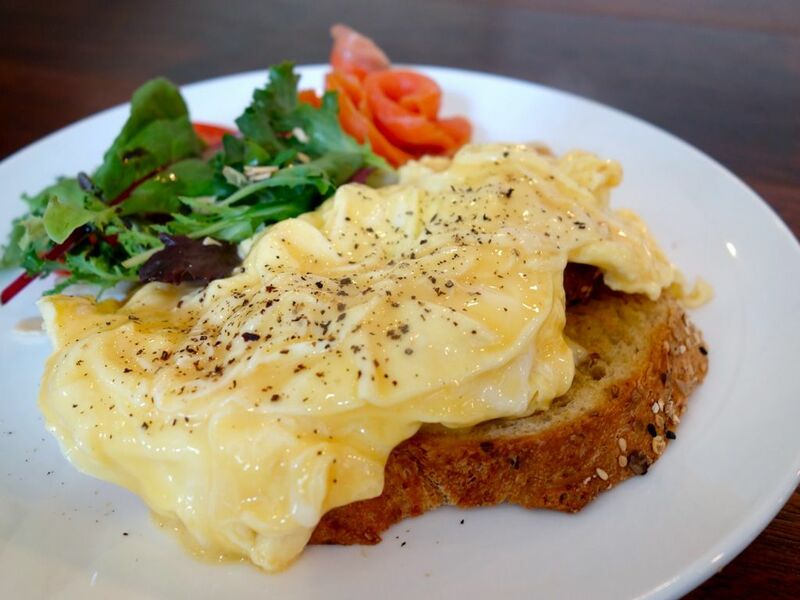 There are a couple of egg options and sandwiches that covers most diners with their Beef, Pork (Pulled), Fish (Smoked Salmon) and Vegetarian (Tomato Basil Cheese) fillings. Other light bites include some pastries and quiches which looked quite amazing. The Scrambled eggs with Smoked Salmon ($13.90) was AMAZEBALLS. It typically comes with croissant but they ran out so we had toast but it turned out rather perfect, mainly because of the fantastic scrambled eggs. The eggs had the perfect amount of butter (more wouldn't kill me for sure) and of the ideal moisture that did not turn the toast soggy. Flawless. 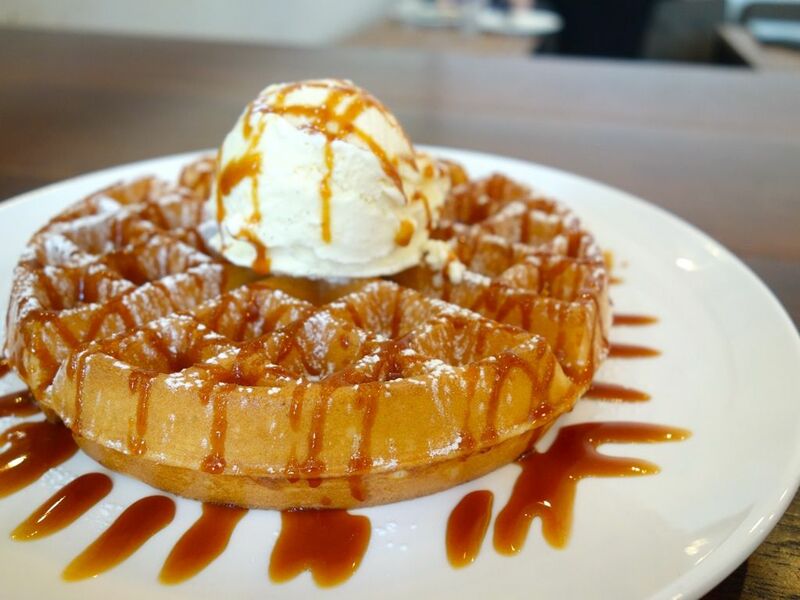 You CANNOT miss the Salted Caramel Buttermilk Waffles ($11.50) with vanilla bean ice cream. What it lacked in the texture department (could be crispier), it made up for in taste! Interesting hint of orange zest, slightly salty batter and perfected salty sweet caramel sauce that's generously drizzled on top. Paired with the creamy and intense vanilla bean ice cream, the result is a unicorn-ride-among-the-rainbows kinda ecstasy. One of the best waffles ever. Nope Strangers Reunion/Waffle Slayer don't cut it. Chocolate & Strawberries Waffle ($11.50) also available here. Go early, go really really early or extremely late (and pray they have eggs and waffle mix). Assembly Coffee is certainly where you'd find me when i need a simple but delicious brunch.